I've been so wrapped up in my own house projects and back recovery that I realized yesterday I haven't shared any updates on the various design boards I have in the works recently. 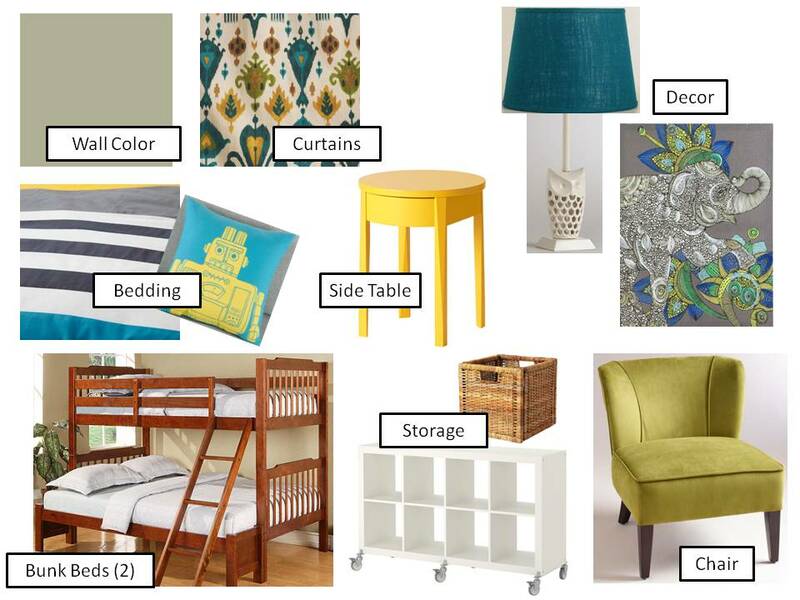 I'm currently working with a friend on her nursery design for her February baby and also working with my in-laws on their three guest rooms for their retirement house that should be ready next summer. You can look back on my first post with my in-laws original design boards for two of the three rooms here. The metal bed is actually from Urban Outfitters but I'm hoping to find a different option at the Round Top Antique Weekend next spring. So far, the lamp and artwork have been purchased for this room. The previous quilt I was planning for this room was discontinued so we're now considering this comforter set. It adds an additional pop of color, is a great price at Waverly, and would be fun paired with subtle curtains, gold throw pillows and white bedding. The nutmeg colored chair is currently on back-order but I've got my name on the waiting list for its arrival in May, so unless we find something else in the meantime, I'm looking forward to picking up this chair just before the house is ready for move in. The other guest room, which Keith and I are hoping to stay in when we visit and also crossing our fingers it's the one just off the private guest patio (no subtlety here), has a blue/green/gold color scheme and will be furnished with pieces my in-laws currently own. 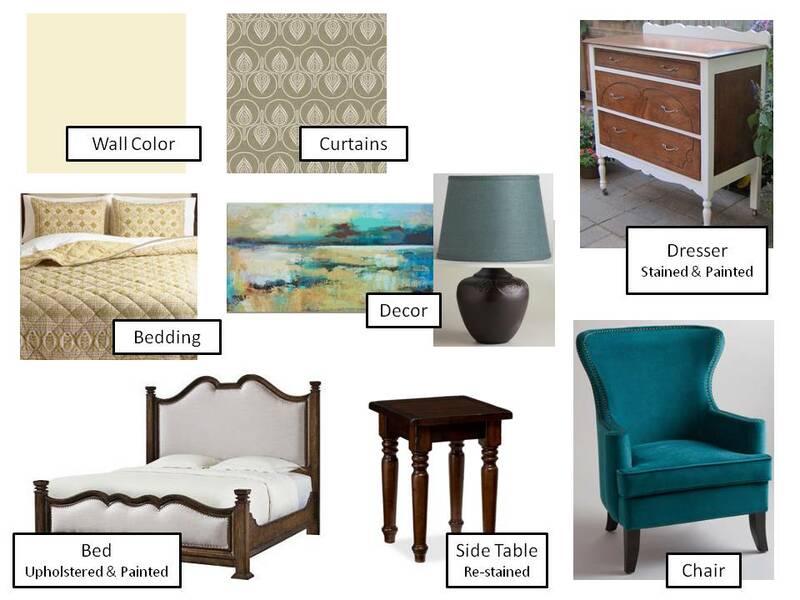 They have given me permission to paint/stain/upholster however I see fit, and I've been enjoying brainstorming all the options for decountry-fying their current pieces. This room has been the most challenging to design at times, because the overall look could continue to change depending on how the refinished furniture turns out. It's had the most purchased already though as we now have the bedding, artwork, lamp base and chair! I just have to mention too that this chair may have been my most exciting purchase yet - it was no longer available online so I went in to my local store and they happened to have one left. As you can tell, it's the same chair but a different color than the red/gold room chair. That's not something I would typically choose since I like rooms to each have unique (yet complimentary) looks, but I couldn't help myself with this piece. It's super comfortable, looks great with the bedding in this room, and it's a really attractive chair at a great price! The third guest room will be on the second floor of the house with its own bathroom and right next to their home theatre. Since my in-laws already have one grandchild (and are not so subtly hoping for several more), we all agreed this room would be the "bunk bed" room. The color scheme is a little more flexible in here so it's more about being a fun, youthful space that could also host adults when necessary (hence the full on bottom and twin on top beds we decided on). This room has gone through multiple design changes so I thought I'd share a few of the initial concepts through to the most current look. The most recent design board evolved from these first few designs and honing in on what appealed to my in-laws and what we all felt made for a fun, youthful vibe but not so childish that adults wouldn't also be open to bunking in here during all the exciting, crazy parties I'm sure this house will host! The only item that has currently been purchased for this room is the lamp base, which is so cute I almost purchased a duplicate for my own office. I originally planned to have a more substantial reading chair in this space, but once I found those large plush floor chairs, I thought they would be perfect for the home theatre. They can easily be picked up and relocated for group movie nights, and my in-laws won't have to buy additional seating in the home theatre for their pint-sized guests. 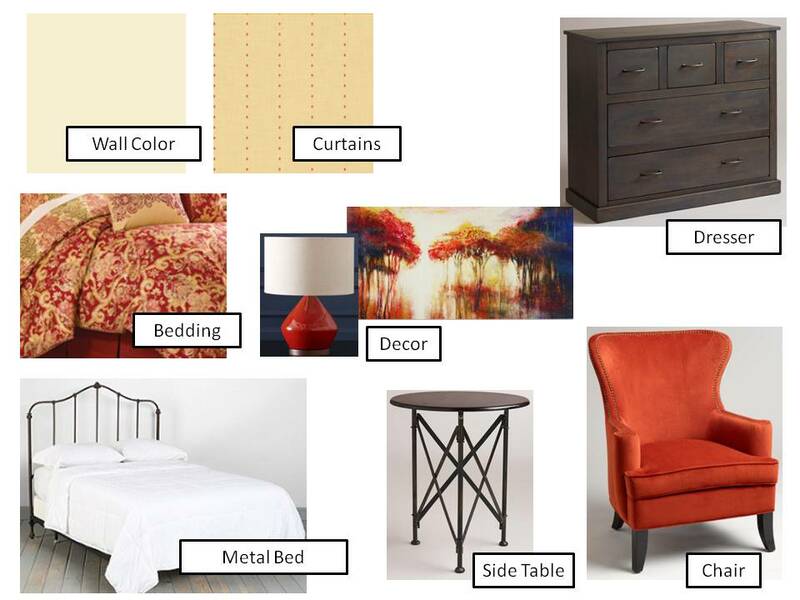 I've had a lot of fun designing these boards with my in-laws and I can't wait to see everything in place once the rooms are done. I've got a few more design (ie artwork) ideas up my sleeve to bring it all together and am looking forward to the final reveal sometime next summer. Note: I've decided not to share the sources for the initial two bunk bed designs, but feel free to email me or comment here if you want to know more about any items. 1) Wall Color - Sherwin-Williams Zero VOC SW 7121 Corona. Bedding from World Market. Curtains from Spoonflower. Chair from World Market. Lamp and lamp shade from World Market. Painting from World Market. 2) Wall Color - Sherwin-Williams Zero VOC SW 7121 Corona. Bedding from Waverly. Curtains from Spoonflower. Side Table from World Market. Metal bed from Urban Outfitters. Chair from World Market. Dresser from World Market. Lamp from West Elm. Print from World Market. 3) Wall Color - Sherwin-Williams Zero VOC SW 7121 Corona. Bunk beds from Wal-Mart. Curtains from Spoonflower. Chair from Land of Nod. Storage and baskets from ikea. Bedding from Pottery Barn Kids. Lamp from World Market. Lamp shade from Target. Easel from ikea. Poster from Urban Outfitters.